In the 10 years after World War II, television exploded into prime time in America. Early American television programs were wildly popular as the public for the first time got to see their favorite stars from radio and movies live on television. TV lamps were originally manufactured because there was a demand for indirect light sources to soothe the eyes while watching television. The 1950s TV lamps were made in exotic and interesting shapes including horses, birds, panthers, and figural shapes. 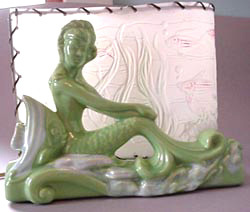 The base portion of the lamp was typically produced in ceramic with a high gloss glaze, although they were also made of plastic and painted plaster. As the rock & roll fifties came along with pink poodles and other whimsical design, 50s colors like pink and chartreuse became very popular and were often coupled with elaborate shades with trim of leather of material. Most TV lamps are backlit with a single bulb hidden from front view, providing a low wattage, indirect lighting source for use while viewing television. 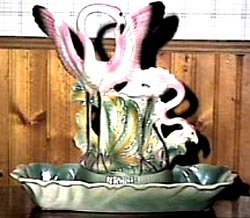 TV lamps were produced in a fascinating array of styles including panthers, stallions, cats, mallards, roosters, fish, poodles, gazelles, and much more. Other TV lamps were produced which were conical in shape but still produced light indirectly off the ceiling, reminiscent of Art Deco indirect torchiere lighting. Some even had perforated holes in the cone, to further disseminate light in an interesting manner. TV lamps also were combined for other purposes in the design, often incorporating a small planter or place for candy to be placed. TV lamps were relatively inexpensive, so their rise paralleled the rise of television as a mass market consumer product. The fact that it was considered somewhat of a medical necessity at the same time further added to their growth in popularity. Sometimes purchasers of televisions were given a free TV lamp as an incentive, perhaps to overcome reticence at watching the small, black and white picture tubes of early sets. As television screens got larger and people could sit further back from the television, the popularity of the TV lamp quickly declined. 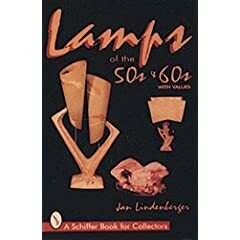 TV lamps were either discarded or placed into boxes in storage, many of which are still being discovered today and bringing stronger and stronger prices as collectors discover 1950s and 1960s design. Whimsical designs like poodles and owls produced in smaller numbers but closely aligned with 50s design tend to bring the strongest prices, as does the production of the Kron company from Texas. Other top manufacturers were McCoy, Royal Haeger, Maddux, and Lane. Buy period 1950s and 1960s TV Lamps and other fifties & sixties collectibles on the Collectics 1950s & 1960s and Lamps & Lighting pages, or search the entire site for great antiques, collectibles, and crafts for every collector!